You can picture your Dream Green…Now what? It’s easy to start creating your personal putting green. We are committed to making your entire experience with Personal Putting Greens a pleasurable one. We visit you at your home to hear your ideas and get a feel for your property. This is a free service Personal Putting Greens offers with no pressure to “buy now”. Based on these discussions we will prepare a detailed proposal for your review. This proposal includes a conceptual drawing of your Personal Putting Green project as well as an itemized cost estimate. Upon your approval of the design and cost proposal, we will schedule a specific installation date as well as order the materials required for your project. Your installation will be performed, as scheduled, by our own professional Greens Crew. Our experienced crew will artfully and skillfully construct your project, as designed, taking care that little damage is done to your existing landscape. As assurance of our ongoing commitment to you, we offer an annual “Greenskeeper Service”. Each spring our Service Crew will visit your putting green to: clean off the putting surface, reset cups, replace the flagstick, edge and groom the sand-traps, replace the trap rake or what ever it is you may desire. With your authorization we perform this “Greenskeeper Service” as needed for a reasonable fee. Because we utilize the best synthetic bent-grass putting turf available and build a stable engineered base, we confidently guarantee our workmanship and all materials used for five years. In fact, putting greens we constructed over 15 years ago still look and play great today. Art and Utility meet. As George Thomas, golf course architect of Bel-Air CC and Riviera CC, said, Both are absolutely vital. 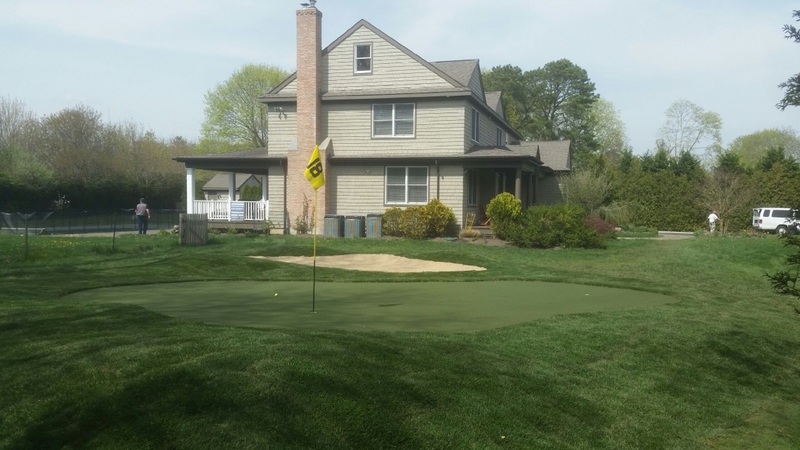 Our goal at Personal Putting Greens is to create a Golf Green for you that artistically blends Form with Function. Construction of your Putting Green begins with the removal of all unsuitable organic material from the Putting Green site. The sub-base is then shaped utilizing a sandyloam fill material to create elevations and contours. 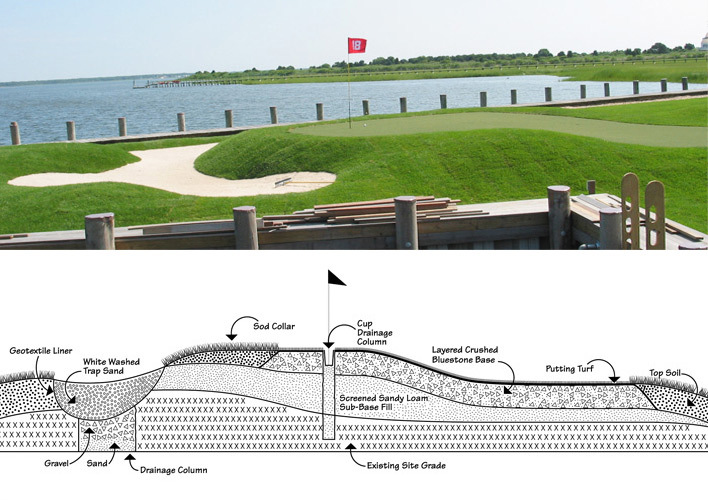 Then, the layered aggregate base is formed to the horizontal and vertical design of the Putting Green. The base consists of different gradations of aggregate, averaging 6″ thick when compacted. Cups are then set into the base with a drainage column beneath each one. Putting Turf is then installed over the prepared base, with the edges secured below the grade. Restoring the perimeter areas requires adding topsoil to match the existing grades and honing the “green side” contours. The installation of sod is preferred around the putting green and sand-bunkers to naturally transition into the existing landscape.